This week in LIFT Enrichment’s after-school cooking class we are teaching kids how to turn zucchini into pasta noodles. No fancy kitchen equipment required. Here’s how you can recreate the dish at home. Cook your zucchini in the olive oil and finish with lemon and Parmesan. This will make the zucchini’s flavors soar. This 3-ingredient combo also elevates chicken, fish, potatoes, rice, broccoli, and so much more. There is a 60-second window for when your zucchini goes from perfectly cooked to mushy. If you time this recipe and cook it in a hot, 12″ saute pan, the first 30 seconds involve cooking the garlic. You can add about 3 cups of the zucchini noodles and cook them with salt and pepper moving constantly for 2-3 minutes. At this point you must check your zucchini for doneness. How to do this? Taste it! It should be slightly firm in the middle. Remove from heat, add the lemon, Parmesan and parsley, check for seasoning and serve. Then watch as your kids eat up this zucchini in seconds! How do I know this? I saw this happen in class yesterday with 14 kids. How do Italians make zucchini taste good? Cook it “al dente” (just like pasta) and then flavor it with lemon and a sprinkle of Parmesan. Shape it to look like noodles to make it extra fun. Wash the zucchini and peel the zucchini into long strips until you reach the seeds, do this for all four sides. 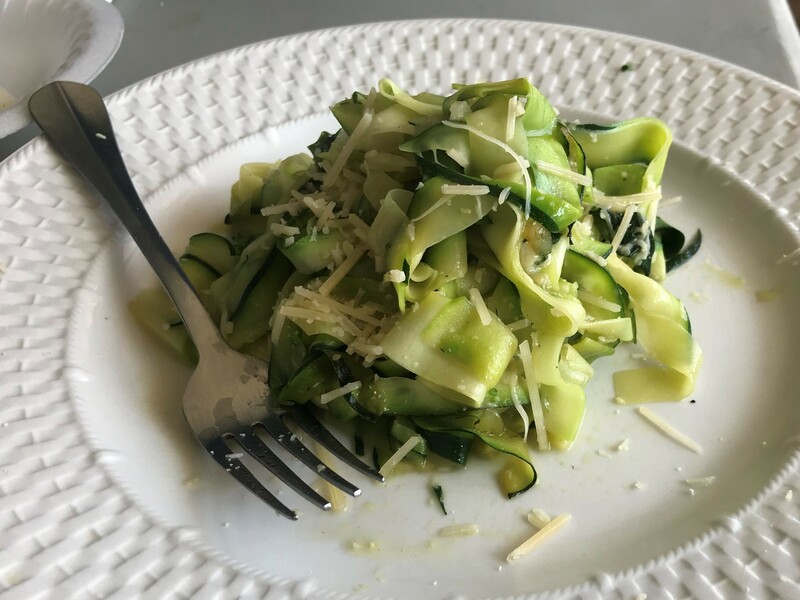 Place 2-3 zucchini ribbons on top of one another and carefully use your knife to cut them into thinner noodles, about the width of fettuccine. To cook the zucchini put 1 Tbsp olive oil and 1 Tbsp butter in a pan over medium-high heat. Add 1 Tbsp of garlic and cook, stirring frequently for 30 seconds. Add about 1/3 of the zucchini, a pinch of salt and pepper and sauté while moving occasionally for 2-3 minutes. Taste the zucchini to make sure it’s al dente, which will be a bit raw in the middle. Don’t worry it will continue cooking when off the pan. The key is not to cook the zucchini noodles down to mush. In the last 10 seconds, add a pinch of parsley, squeeze of lemon juice and serve on a plate. Top with Parmesan cheese, taste and adjust seasoning as needed. Continue cooking the remaining zucchini in batches. This dish tastes fantastic when it’s freshly made, so enjoy it straight from the pan. If you’re interested in your child learning this recipe in our after-school cooking class go here.